Taking comfort to new levels. Constructed from state-of-the-art Thunderbike Power and New Monica fabrics with minimal seams, the Tono 2.0 bib-shorts are cutting-edge technology. The revolutionary design has no elastic at the bottom of the leg. Instead, the inside of the shorts are peppered with silicon microdots, so they adhere perfectly to your skin at every point. Taking comfort to new levels. Constructed from state-of-the-art Thunderbike Power and New Monica fabrics with minimal seams, the Tono 2.0 bib-shorts are cutting-edge technology. The revolutionary design has no elastic at the bottom of the leg. Instead, the inside of the shorts are peppered with silicon microdots, so they adhere perfectly to your skin at every point. No pulling, no stretching. 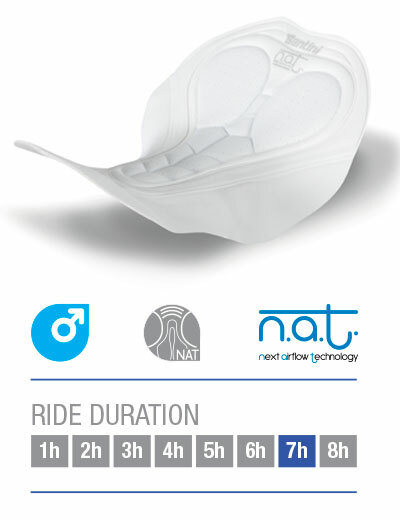 The NAT chamois, with anti-shock and ice-effect NEXT gel core keeps you cool even after long hours in the saddle. The braces are seamless and super-elastic so you wont feel constricted, making them ideal for even the tallest riders. PERFECT FIT Sidebands made in Thunderbike Power fabric with built-in tattoo effect dotted silicon grip. COOLING CHAMOIS New NAT chamois, with cooling technology and ergonomic 3D surface. EXTREME COMFORT Elastic seamless braces, cling to the body without restriction. NAT (NEXT, Airflow, Thermoshock) est un nouvel insert chamois révolutionnaire - il s'agit du premier rembourrage Santini de la future génération. Le noyau NEXT est entouré de deux couches de mousse de 2 et 4 mm d'épaisseur. La couche supérieure est une microfibre antibactérienne qui garantit une hygiène maximale au contact de la peau. A la base du rembourrage, deux ailes anatomiques en microfibre douce protègent de l'irritation et de la douleur les zones les plus sensibles. Pantaloncino ben tagliato. Aderente ma comodo. Ottime le fasce elastiche di sostegno sulle spalle e quella a fine gamba. Used these shorts in Tuscany while on vacation last fall. The days were hot snd sticky while I was there and the shorts never gave me any reason to complain. They stayed in place and the chamois was excellent for the long days in the saddle. This is the fourth set of bib shorts that I,ve purchased from Santini and I love this set as much as the others that I've purchased. The fit is great, the quality is great and the customer service is wonderful. 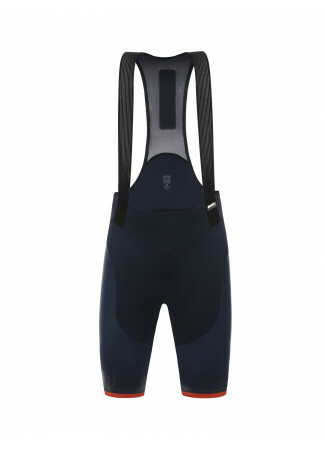 Thanks Santini, you're the first place I shop when I'm looking for bib shorts. Perfect fit, awesome design .. A little bit less comfortable than I thought, but all in all it's a very good product bib short. 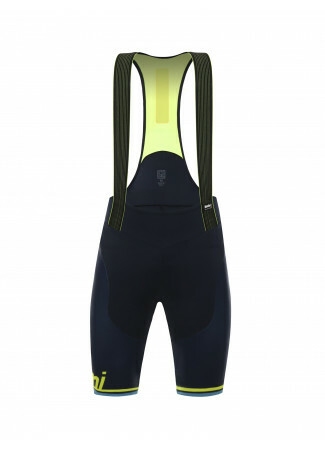 This is my 4th Santini bib short. It is not accidental. As the previous three it is extremely comfortable. I like the NAT chamois. I have tried it in 30 C degree. I has quite good ventilation and nice cold feeling. About the sizing: I think Santini has a good sizing guide. I am a skinny biker (187 cm tall, 73 kg) XXL fits me like well. It has a nice race fit. I am satisfied with it. This kit is quickly becoming my favourite. Very comfortable and once you adjust the legs they stay in place during the ride. Great for hot weather riding. Fondello eccezionale anche dopo molte ore in sella. Considerato che il mio girovita è di 87cm e la mia vita 93 cm con altezza 1,84 taglia L sta perfetta. 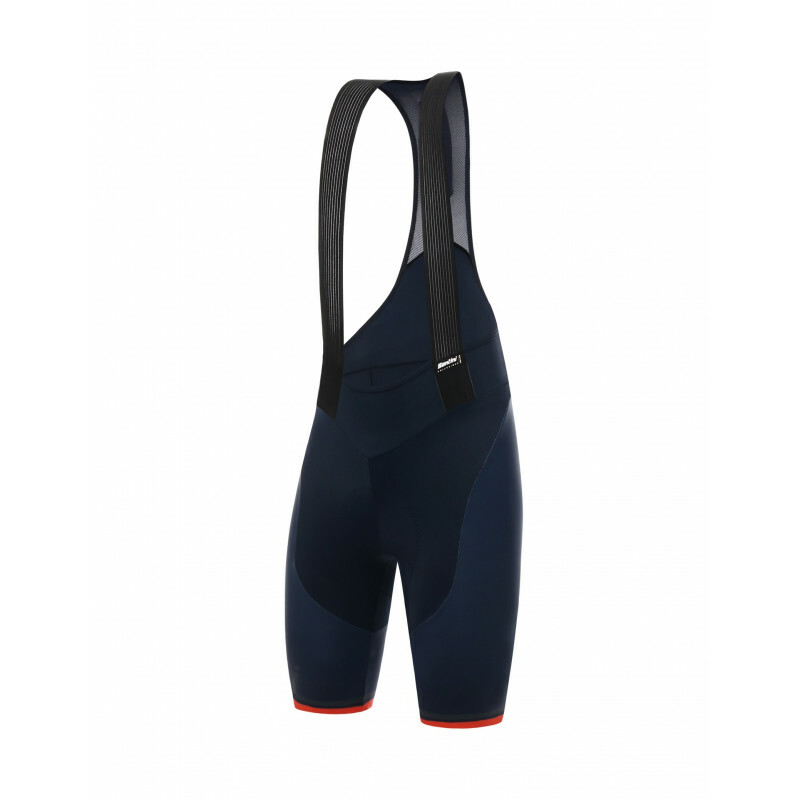 This is the first Santini bib-short I have bought and I was surprised by the perfect fit of the bib-short. 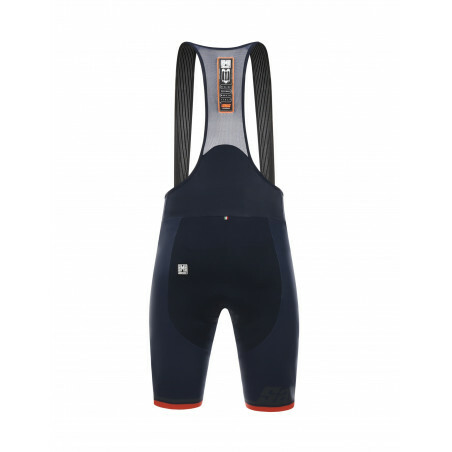 I am not a small guy and the fit is perfect for a tall Dutch rider, although I need a larger size (XXL) instead of the normal sizing (like Assos XL). The chamois is not to thick, but still very comfortable. The finish of the bib-short is extraordinary and so is the quality of the fabric. But because this is my first Santini bib-short (together with a Redux) I can't say anything about the durability in long term. Peau de chamois très confortable sur longue distance. Rien à redire, parfait! Prodotto eccellente come ci ha abituato Santini ormai da molto tempo. Lorgun sempre strepitoso. Il migliore sul web. Good quality bib shorts. Confortable and light. Great Bib Shorts. adheres to the skin like a second skin. the "tatoo" effect is awesome. Turning heads in the group ride is common now with Santini. Fit is as expected. I'm 5.7 (1.70mts) with 65kg (145lbs). I use the Medium Bib. The padding is comfortable for long rides and the compression is just right for shorter punchier group rides. Pantalone elastico ed aderente in maniera perfetta. Una volta indossato sembra scomparire. Il tessuto morbido produce un effetto molto confortevole e piacevole sulle gambe. Non delude le aspettative anzi le supera. Capo ideale anche per lunghe uscite grazie ad un ottimo fondello. NULLA DA DIRE ANZI SOLO UNA PAROLA "PERFETTO"
Le cuissard est comme une second peau, Il épouse très bien les forme des cuisses. Grace à la bande adhésive, le cuissard ne bouge pas. On l'oublie et le confort de la peau est très bien. Je le conseille. Tono bibs provide real comfort fit with comfortable seat pad . Vestono molto bene, non si muovono ed il fondello consente di fare giri molto lunghi ( io l'ho tenuto per più di cinque ore senza nessun fastidio). Consigliato assolutamente. Ottimo pantaloncino per giro di allenamento, molto comodo il fondello e la traspirabilitá dei materiali, consiglio vivamente a tutti coloro che vogliono un abbigliamento comodo ed essenziale, veloce la consegna, grazie santini! Great short! 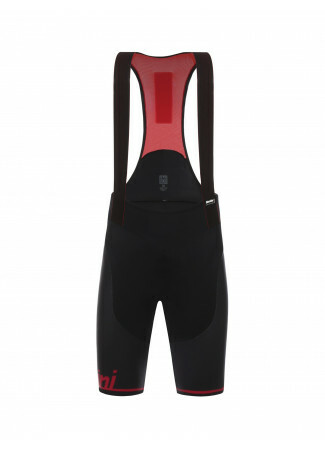 It feals great, almost seamless, I like my other Santini chamois a little better, but still great value for good price! Provato in una uscita di circa 5 ore, molto comodo il fondello e super il fondo gamba con grip perfetto. Bretelle comode, anche senza sottomaglia nessuna irritazione. La taille correspond bien aux infos du site. Coupé juste, il se met facilement en place et ne bouge plus. calza come un guanto, ed il fondello è molto confortevole, assolutamente consigliato. Se ajusta perfectamente a las piernas, un pelín apretado en mi caso pero no molesto. Cuesta meterlo un poco. Seguí las indicaciones de talla. Lo he probado poco todavía, pero de momento ninguna pega a la badana sobre MTB. Oggetto conforme , come da descrizione. Spedizione velocissima! Det är dom bästa Bibshorts jag har. Storleken passar perfect, och comforten är jättebra för längre distanser. 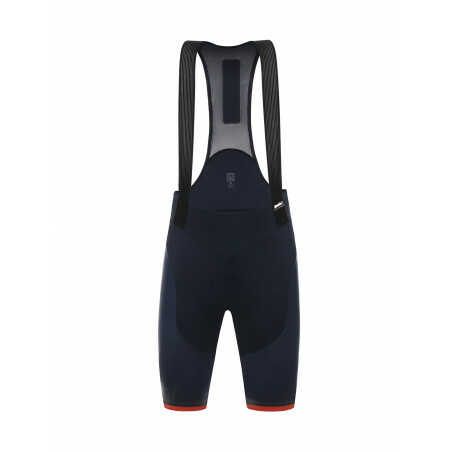 A very comfortable pair of bib shorts, now my go to pair for the bumpy roads of Yorkshire! The padding is excellent, far superior to my older pairs from other brands. Overall, excellent. Questo paio di bib short sono molto confortevoli, i migliori che abbia mai provato, il fondello è ottimo anche su selle con minima imbottitura, il taglio particolare che hanno favorisce i movimenti così come le bretelle che si adattano senza costringere. Se dovessi avere bisogno di un nuovo paio di pantaloncini non esiteró a comprare gli stessi. Non ho riscontrato nessuna nota negativa. possiedo già i tono 1.0 e ho preso anche i 2.0, che dire: fondello buono anche per 4/5 ore in sella, tessuto traspirante ma soprattutto il taglio al vivo sulla gamba, è il dettaglio che preferisco e che me li ha fatti scegliere, li indossi e ti dimentichi di averli. Una sola cucitura nell'interno coscia e il silicone all'interno completano il tutto: comfort e stabilità. Modificherei solo l'elastico delle spalline rendendolo più leggero. A secondhand skin! Formidable dit! Stupendi. Calzano come un guanto. The shorts are super comfy and fit superbly in all areas .